Objectives—To undertake a prospective epidemiological study of the injuries sustained in English professional football over two competitive seasons. Methods—Player injuries were annotated by club medical staff at 91 professional football clubs. A specific injury audit questionnaire was used together with a weekly form that documented each club's current injury status. Results—A total of 6030 injuries were reported over the two seasons with an average of 1.3 injuries per player per season. The mean (SD) number of days absent for each injury was 24.2 (40.2), with 78% of the injuries leading to a minimum of one competitive match being missed. The injury incidence varied throughout the season, with training injuries peaking during July (p<0.05) and match injuries peaking during August (p<0.05). Competition injuries represented 63% of those reported, significantly (p<0.01) more of these injuries occurring towards the end of both halves. Strains (37%) and sprains (19%) were the major injury types, the lower extremity being the site of 87% of the injuries reported. Most injury mechanisms were classified as being non-contact (58%). Re-injuries accounted for 7% of all injuries, 66% of these being classified as either a strain or a sprain. The severity of re-injuries was greater than the initial injury (p<0.01). Conclusions—Professional football players are exposed to a high risk of injury and there is a need to investigate ways of reducing this risk. Areas that warrant attention include the training programmes implemented by clubs during various stages of the season, the factors contributing to the pattern of injuries during matches with respect to time, and the rehabilitation protocols employed by clubs. Based on one of the largest epidemiological based surveys conducted in professional football, the industry has been confirmed as having a high risk of injury with an excessive number of player days being lost. Preventive strategies need to be implemented, and specific areas that warrant further investigation include factors contributing to the increase in injuries towards the end of both halves of matches, the higher incidence of injuries during specific periods of the season, and the criteria for return to playing activity after injury. Football is known to be associated with a relatively high injury rate, the overall level of injury to professional footballers recently being shown to be around 1000 times higher than for industrial occupations generally regarded as high risk.1 The number of prospective studies in professional football is limited1–5; however, the research does imply that football injuries are indeed a problem and calls for preventive action based on the results of epidemiological research. To ensure the health and safety of professional footballers, efforts must be made to prevent and control injuries. Data must be made available through an effective injury surveillance system, and knowledge of the factors that influence injury are required. There is a need to identify the high risk groups and their respective dependent and independent variables, which are likely to differ in each footballing population,6 and therefore epidemiological and aetiological injury data for English professional football need to be captured. The process of injury prevention can be considered in four stages.7 Firstly, the extent of the sports injury problem must be identified and described. Secondly, the factors and mechanisms that play a part in the occurrence of the injuries have to be identified. This is followed by the introduction of preventive strategies, and then, by returning to the first stage, the audit cycle is completed. The aim of this work was to implement the first stage of the audit cycle by undertaking a comprehensive prospective epidemiological study of the injuries sustained in English professional football over two competitive seasons. Player injuries were prospectively reported from July 1997 through to the end of May 1999. Ninety one of the 92 football clubs from the four professional English leagues (Premier and the three Football Leagues) originally committed themselves to the project which involved those players competing at a professional level. All players involved were asked to complete a consent form, each club providing details of their squad at the beginning of each season. Table 1 presents the information obtained. Injuries were annotated by the clubs' medical staff. A medical practitioner at each club recorded their injury data on a player injury audit questionnaire designed for this study. A recordable injury was defined as one received during training or competition and which prevented the injured party from participating in normal training or competition for more than 48 hours, not including the day of the injury. Absence arising from sickness or any other condition requiring examination from the player's general practitioner was not included in the study. The severity of each injury was defined as slight, minor, moderate, or major depending on whether the player was absent from training or competition for two to three days, four to seven days, one to four weeks, or more than four weeks respectively. Injury audit questionnaires for players who had returned to full training/competition during a particular week were returned together with a weekly form from each club indicating which players had been absent and the number of days and competitive matches each had missed that week because of their injury. Data were analysed using SPSS (Chicago, Illinois, USA). The χ2 significance test and Student's t test were used to investigate differences between variables, and statistical significance was accepted at the 95% confidence level. Values are reported as mean (SD). Of the 91 clubs starting the study, completed injury records for the whole of the 1997/1998 and 1998/1999 competitive seasons were attained from 87% and 76% respectively. The observation period began with 2376 players (table 1). The population did not change significantly in terms of proportions. During the period of study, 6030 injuries resulting from training and/or competition were documented, 1745 and 1462 players sustaining injuries during the 1997/1998 and 1998/1999 seasons respectively, with an average injury rate of 1.3 per player per season. During training and competition, 34% and 63% of the injuries were sustained respectively, the remainder not being specified. Table 2 displays the severity of all the injuries, 68% being classified as either minor or moderate, with a further 23% preventing the injured player from training or playing for at least four weeks. The total number of days that players were absent over the two full seasons was 145 973 (24.2 (40.2) days per injury) and a total of 23 876 matches were missed (4.0 (6.5) matches per injury). Figure 1 shows the mean number of injuries sustained at each club per month during training and competition. The number of injuries sustained during training gradually decreased throughout the season, the injury incidence being different between months (p<0.05). The greatest incidence of match injuries was during the month of August (p<0.05), the incidence remaining fairly consistent throughout the remainder of the playing season. 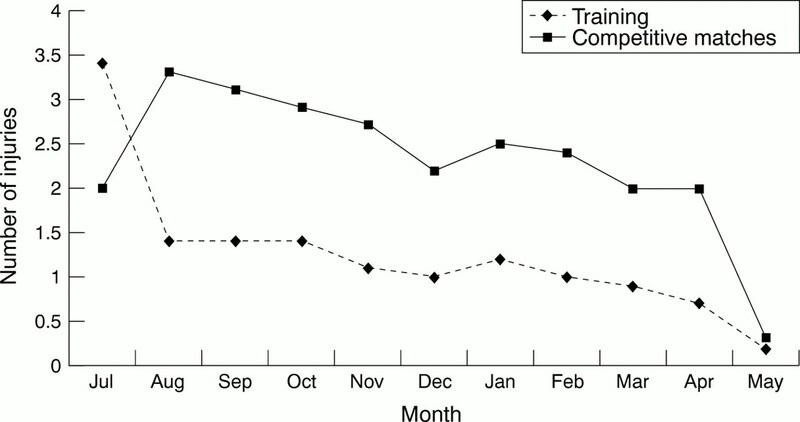 Mean number of injuries sustained during training and competitive matches per month for individual clubs. Table 3 gives the nature of the injuries sustained during training and matches. Injuries classified as strains, sprains, or contusions represented 69% of all the injuries. Injuries grouped as “other” in table 3 include back and nerve related problems, disc derangements, and non-specific pain, no individual category amounting to more than 0.5% of all injuries. A greater number of injuries were sustained to the players' dominant side compared with the non-dominant (50% v 37%, p<0.01), and the lower extremity was the site of 87% of the injuries reported (table 4). Most of the thigh injuries were muscular strains (81%). Table 5 indicates strains to the hamstring and quadriceps muscle groups. Of the injuries to the knee, 39% were ligament sprains, 75% of which were to the medial collateral ligament. Injuries to the ankle were predominantly ligament sprains (67%), over 80% being to the lateral ligament complex. Table 6 shows the injury mechanisms, 38% being classified as resulting from contact with another player or the ball and 58% having a non-contact mechanism. Figure 2 shows the distribution of the competitive match injuries with respect to time. From the 3836 injuries for which the time of injury was known, a greater than average frequency of injuries were observed during the final 15 minutes of the first half and the final 30 minutes of the second (p<0.01). Despite the increase in injury incidence towards the later stages of the first half, there remained a greater number of injuries recorded in the second half than in the first (57% v 43%, p<0.01). 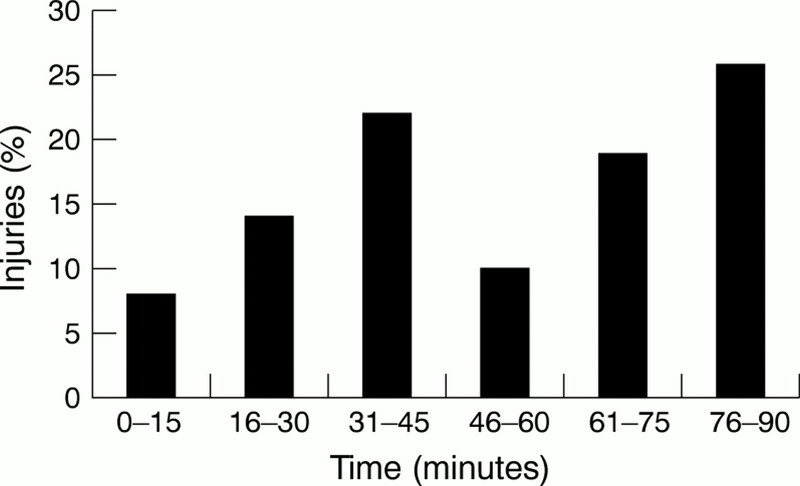 Time of occurrence of injuries in competitive football matches. Re-injuries were accountable for 7% of all the injuries sustained during the study period. Of the 420 re-injuries that were documented, 66% were either strains or sprains (48% and 18% respectively; table 7). There were many instances where a player had already sustained one injury during the season which was subsequently followed by an injury to the same anatomical location in the next injury episode during the same season (table 8); these were not classified as re-injuries. Re-injuries within the same season were found to be more severe than the previous injury, the number of missed training days averaging 25.1 (31.8) compared with 19.1 (27.3) days for the initial injury (p<0.01). The definition of injury used follows that used by other authors.8, 9 Four classes of injury severity were defined, similar classification systems having been used elsewhere.1, 10–13 The inclusion of “slight” injuries (two to three days) in the current study allows calculations to be made about those injuries that are reportable under the Reporting of Injuries, Diseases and Dangerous Occurrences Regulations (RIDDOR).14 It was deemed that reporting of injuries that prevented normal participation for less than 48 hours was impractical because of the working practices within professional football. The incidence of injury has previously been reported to vary over different periods of the playing season,1–3, 10, 13 peak rates being found to occur after preseason training and the mid-season break and during match intensive periods. The current study lends some support to the work of these authors, training injuries peaking during July (p<0.05) and match injuries peaking during the first month of the playing season after the preseason training period (August, p<0.05), both of which displayed comparable declines during the remainder of the season. Exposure has not been accounted for in the current work; however, where the number of matches has previously been considered, August has been reported to be the period during which most competitive match injuries occurred.1 It seems possible that during this period, the first month of the competitive playing season, the players have not yet reached appropriate levels of fitness and are therefore not in optimal physical and physiological states to be able to withstand the stresses associated with competitive football. Because of the disproportionate number of training injuries observed during July, consideration must be given to the content and progression of preseason training programmes and the implementation of fitness maintenance work during the closed season. Concerns surrounding these two periods of the football calendar have previously been documented.1 Furthermore, the greater proportion of overuse injuries, including tendinitis and paratendinitis, during the preseason period compared with the in season (10.2% v 5.8%, p<0.01) highlights the need to address this matter. Overall, two thirds of the injuries were sustained during competitive match play while one third occurred during regular training. The injuries sustained were predominantly strains, sprains, and contusions, which supports the results of previous research,1–4, 10 the percentage of muscular strains being almost twice that of any other injury category reported in the current study. It has been previously suggested that artificial surfaces result in injury profiles different from those on natural turf pitches,16 but this was not confirmed by the current research. The proportion of different types of injury was different between training and matches, the percentage of contusions in matches and strains in training both being greater than average (p<0.01). The number of contusions sustained in matches could be expected considering the competitive atmosphere of matches compared with training; however, the higher proportion of strains observed in training is cause for concern. There is a need to investigate in detail some of the intrinsic and extrinsic factors that have previously been associated with injuries7, 17, 18 before preventive strategies can be advised. Fatigue, both central brain and local muscle, has previously been identified as a possible causative factor of injuries.20 This aspect needs consideration when the time elapsed during a competitive match at the point of injury is investigated. It is in the two 15 minute periods towards the end of both halves that the greatest injury incidence rates occur, with more injuries occurring during the second half of matches than during the first (p<0.01), confirming the findings of Hawkins and Fuller.1 Gleeson et al21 reported that, by simulating the physiological demands of soccer match play, the risk of ligamentous injury may be increased by concomitant increases in electromechanical delay and anterior tibiofemoral displacement. This is likely to impact on the number of injuries sustained by both contact and non-contact injury mechanisms during fatigue induced situations. The role of muscle fatigue has previously been discussed and identified as a factor in injury causation,22 and it is believed that this can partly explain the greater injury incidence observed in the second half of competitive matches, especially during the final 15 minutes. Return to activity prematurely and inadequate rehabilitation have previously been reported as injury risk factors, a high percentage of re-injuries having been found to occur in football. Ekstrand and Gillquist23 attributed 17% of the injuries reported in their study to inadequate rehabilitation, and similarly Nielsen and Yde12 found 25% of the players who were injured had not completely recovered from a previous injury which was of the same type and location. More recently re-injuries were accountable for 22% of all the injuries reported.1 The current work attributes 7% of the reported injuries to re-injuries, 66% being either strains or sprains to regions of the lower extremity. Re-injury rates as high as 30% have previously been reported for muscular strains and ligamentous sprains,1, 24 whereas the current work reports figures of 9% and 7% respectively. There is still a necessity for controlled rehabilitation and strict adherence to programmes, the benchmarking of players enabling rehabilitation goals to be set and specific criteria established that must be met before a player is able to return to normal activity. This is further emphasised when the severity of re-injuries is considered, the current work confirming the findings of Ekstrand,10 who reported major injuries to have been preceded by minor injuries of the same type and locality. Additional to this, the current work clearly shows that the locations of many subsequent injuries are significantly biased towards the locality of the preceding injury episode. It is expected that the epidemiological data obtained from this study will not only aid professional football clubs in complying with current health and safety legislation, but will provide insight into the causes of injuries in English professional football. The correct use of these data is aimed to prevent potential hazards arising and reduce the severity of those that take place. Areas that warrant further investigation include the prevention and rehabilitation of muscular strains and ligamentous sprains, proprioceptive training having previously been shown to reduce the latter.25, 26 Risk factors for specific injuries with high prevalence are being studied further and the injury epidemiological research is continuing, ensuring that the audit cycle remains intact. We wish to acknowledge the financial support given by the Professional Footballers' Association together with the support of The League Managers Association, The Premier League, and The Football League, and the commitment of the medical practitioners working at professional football clubs in England and Wales. We also gratefully acknowledge the contributions made by the members of the Project Consultative Committee Working Group, namely Dr C Cowie, Mr A Jones, Mr G Lewin, and Dr M Waller. McGregor JC, Rae A. A review of injuries to professional footballers in a premier football team (1990–93). Scot Med J1995;40:16–18. McPherson K. Injuries to professional football players. Oxford: Department of Medicine and General Practice, University of Oxford, 1985. Inklaar H. Soccer injuries II: aetiology and prevention. Sports Med1994;18:81–93. Vinger PF. Sports injuries. Littleton, MA: PSG Publishing Co, 1981. Council of Europe. Sport for all: sports injuries and their prevention. Oosterbeek, The Netherlands: Council of Europe, 1989. Ekstrand J. Soccer injuries and their prevention. Linkoping University Medical Dissertations. Linkoping, Sweden: Linkoping University, 1982:No 130. Engstrom B, Forssblad M, Johansson C, et al. Does a major knee injury definitely sideline an elite soccer player? Am J Sports Med1990;18:101–5. Sandelin J, Santavirta S, Kiviluoto O. Acute soccer injuries in Finland in 1980. Br J Sports Med1985;19:30–3. Reporting of Injuries, Diseases and Dangerous Occurrences Regulations 1995. London: HMSO, 1995; vol SI 1995:no 2023. Weightman D, Browne RC. Injuries in eleven selected sports. Br J Sports Med1975;9:136–41. Lees A, Nolan L. The biomechanics of soccer: a review. J Sports Sci1998;16:211–34. Taimela S, Kujala UM, Osterman K. Intrinsic risk factors and athletic injuries. Sports Med1990;9:205–15. Nigg BM. Causes of injuries: extrinsic factors. In: Dirix A, Knuttgen HG, Tittel K, eds. The Olympic book of sports medicine. Oxford: Blackwell Scientific Publications, 1988:363–75. Davis JM, Bailey SP. Possible mechanisms of central nervous system fatigue during exercise. Med Sci Sports Exerc1996;29:45–57. Gleeson NP, Reilly T, Mercer T, et al. Influence of acute endurance activity on leg neuromuscular and musculoskeletal performance. Med Sci Sports Exerc1998;30:596–608. Lieber RL, Friden J. Selective damage of fast glycolytic muscle fibers with eccentric contraction of the rabbit tibialis anterior. Acta Physiol Scand1988;133:587–8. Ekstrand J, Gillquist J. The avoidability of soccer injuries. Int J Sports Med1983;4:124–8. Lysens RJJ. Epidemiological study of soccer injuries in the 18 teams of the first national division of the Royal Belgium Soccer Association (RBSA) during the season 1980–1981. In: van der Togt CR, Kemper ABA, Koornneef M, eds. Proceedings 3rd Meeting Council of Europe: sports injuries and their prevention. Oosterbeek: National Institute for Sports Health Care, 1988:53–7. Sheth P, Yu B, Laskowski ER, An K. Ankle disk training influences reaction times of selected muscles in a simulated ankle sprain. Am J Sports Med1997;25:538–43.